Sorry guys, Issue 4 in full colour will not be ready in time for Fan Expo Canada (August 22-24). I will have an ashcan preview ready for the show. It will have a good chunk of the story, and reveal the CERBERUS! It will include some guest pin-ups as well as some of my CGI artwork and sketches! I exhibited at Wizard World Chicago last weekend. I almost didn't go. The past two weeks leading up to Chicago were all a blur. First, I had just come back from Korea and was adjusting to the time zone. Then I went to New York for the Licensing Expo right after. Went through a period of 40 hours with no sleep. It was literally the longest day in my life. Came back to work at the visual effects studio, working on no less than four movies at the same time. And working on Mattel freelance during the evenings. There was no fiscal or emotional reason to go back to Chicago. I had cancled last year's show, and figured nobody would notice. I also could not make it to Thursday or Friday of the show. I just couldn't take the time off. A couple of friends of mine had bought one of my artist alley tables at a discount, so the most I would have stood to lose was $400 on my table fees. I could take that weekend to just recover and catch up on my freelance work. Instead, I reluctantly decided to go, and try to make the most of Saturday and Sunday. Saturday morning started off the horrible news that Michael Turner had died. I have seen him many times at Fan Expo in Toronto, but only spoken to him once. That one time I talked to him, he came across as very polite and soft spoken. Definately the most humble artist that was also superstar in his industry. Although I barely knew him, because we both publish an underwater comic book, there's was a strange connection I felt with him. He didn't know that I existed, but I kept an 'arms length' tab on his work at all times. I liked his artwork sometimes, and at other times didn't understand what was so special about it. 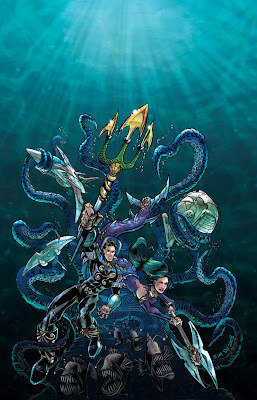 I would occasionally pick up a copy of Fathom, just to see what he was doing with the underwater art. I tried not to read it, in order to prevent any sort of influence to affect Crozonia. Although I didn't always like his work, Michael Turner's artwork and career were very compelling to me. I couldn't stop thinking about him during the show. Sales were steady, but when selling comic books $3 at a time, it really doesn't matter to me anymore whether I sell 100 or 200 books. It's not going to change the fact that working on comic books is now just a sporadic weekend pastime. I have been struggling with the reason why I self publish. I've sank about $4K per book, and only Issue one has finally broke even in sales. I'm tired of going to conventions, doing the hard sell, explaining my comic book only to have people walk away. I put more than 500+ hours into each issue. Why? I keep telling myself it's a labour of love. But I don't love the labour, and my love for comic books has waned. Will I ever get a hollywood deal? After wading through the BS that was San Diego Comic Con producers, not likely. Sometime late Saturday afternoon, a 10 year old girl saw my mermaid banner. Her eyes lit up, and she called out for her dad. It turns out this girl bought my Crozonia #1&2 two years ago. She went searching for me last year, but I wasn't there. She also looked for me on Thursday and Friday, but I wasn't there. She finally found me on Saturday, picked up Issue #3, and crossed my name off her 'to do list'. Wow. I'm on somebody's list. I was so humbled, I gave her a gift. A little CD-comic book I had drawn for Mattel. That little girl made my day. And there were a handfull of others who came by saying they looked for me last year. They all picked up Issue 3after a two year wait. My sales were enough to just pay for the trip. I may have squeaked out of there with a couple hundred dollars in net profit. And I'm exhausted. And really behind on my freelance work now. But it was worth it. I'm sure there's a hundred other artists in Chicago that are just like me. Working hard on their own comic book only to see their passion slowly slip. For most of us, there is not comic book fame or fortune at the end of the tunnel. I think I'm rambling, there's no concise statement I trying to say or to 'inspire' my fellow artists. Perhaps I just want to thank that little girl in Chicago for making my trip worthwhile.